Slash the chicken thighs deeply a few times on the skin side, all the way through to the bone, and add to a large food bag. This will help the marinade flavours soak into the meat. Mix the soy sauce, ginger, garlic and a grind of black pepper in a small bowl, then pour into the bag of chicken. Seal the bag up tightly, pressing out as much air as possible, and give it a good squish about to coat the chicken really well. Rest the bag on a plate and leave to marinate in the fridge for a few hours, or ideally overnight. Preheat the barbecue until it reaches a low steady temperature. With gas this will only take a few minutes. With charcoal, get the coals lit in a pile to one side of the barbecue and leave to burn until you have glowing coals with a white dusty outer. You then grill on the side where they are no coals, creating a lower, more even heat. Which ever way you are grilling, lay your chicken skin side up onto the grill bars and shut the barbecue lid. Leave to cook without turning over for a good 20-30 minutes, checking a couple of times to make sure they are cooking evenly. Whilst the chicken is having its initial grill, prepare the cabbage and dressing. Lay on a chopping board and cut through the root into half, then cut each half into 3 or 4 wedges through the root. Brush all over with just a little oil. Get the dressing ready by adding the butter, lime juice and soy to a small heatproof pan (no plastic handles), add the chilli flakes if you are using, and season with a good grind of black pepper. Once the chicken has had its initial cook skin side up, turn over so the thighs are now skin side down. Cook for a further 15 minutes, keeping slightly more of an eye on them and moving them around once or twice to make sure they are cooking evenly and not burning. At the same time, rest the dressing pan on a cool part of the barbecue so the butter gently melts, and mixes in with the lime and soy. 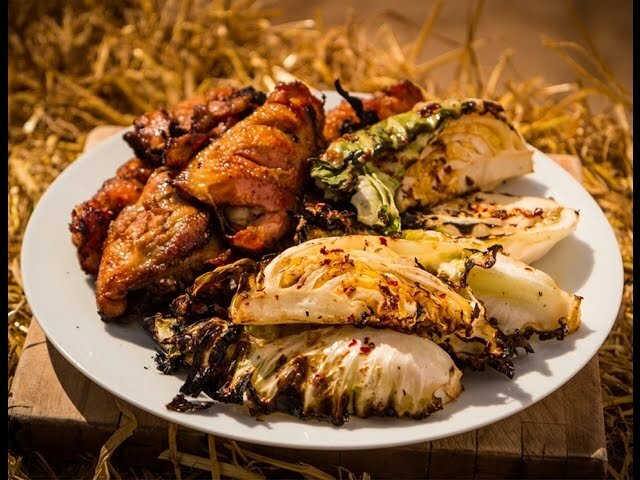 Lay the cabbage wedges over a high heat – so either directly over the coals if you are using charcoal, or over a burner turned to high if you are using gas. Allow them to cook and lightly chargrill before turning over. Keep grilling, turning regular for around 20 minutes so the are cooked evenly and just tender but still with a little crunch. Turn the chicken back over again and brush the tops with a little honey to glaze them. Turn over, and allow to cook for a couple of minutes whilst you brush the other side, then flip over one last time to cook for a final couple of minutes. When everything is cooked, pile the cabbage into a bowl, and pour over the dressing, toss the wedges to coat and serve alongside the chicken.